Microscopes can be defined as instruments which are used to see a small object or particals by magnifying it. There are many types including optical, electron and x-ray. The most common type is the optical version which forms images from visible light by using lenses. If it uses one single lens then it is known as a simple microscope. With two lenses, it is known as a compound microscope. The lens closer to the eye is called the eyepiece and the lens at the other end is called the objective. 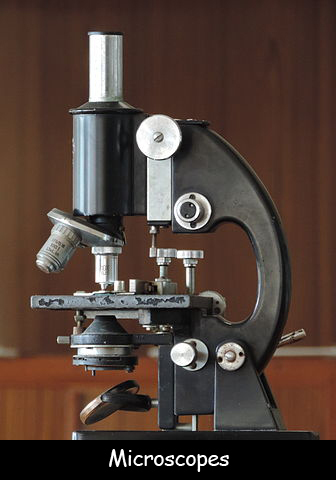 Compound microscope was invented in the 1590s for the very first time. They are most commonly used to study minute objects and have been used in various forms for more than 3,000 years. The first ever microscope was originally used to study insect. This is also the reason why it got the name ‘Flea Glass’. Any microscope gets its magnifying power by multiplying the power of the respective objective lenses. An object can be magnified millions of times when it is being viewed through an electron microscope. A single lens microscope was invented in the 1660s by Antony van Leeuwenhoek. It could magnify an object up to 200 times. The resolution of any microscope can be defined as the ability to see items clearly and separately under the lens. When an object is photographed while under the microscope, it is known as a micrograph. The smallest sample ever seen using a light microscope was an object 500 nanometer long. Declan, Tobin. " Amazing Facts for Kids about Microscopes ." Easy Science for Kids, Apr 2019. Web. 23 Apr 2019. < https://easyscienceforkids.com/all-about-microscopes/ >.